The Underground Railroad was a secret network of safe houses and abolitionists who helped slaves escape to freedom during the period before the American Civil War. Every person who sheltered runaways or provided food, clothing, and assistance was considered part of the railroad. Escaping slaves typically traveled hundreds of miles to reach freedom. Their routes took them through woods, fields, and across rivers. Traveling by night to avoid detection, they often used the North Star as a guide to the north. They traveled on coaches, trains, and steamships, but most often by wagon or on foot. The homes and businesses where fugitives would rest and eat were called "stations" and were run by "stationmasters." Those that helped transport the escaped slaves were called "conductors." Though loosely organized, tens of thousands of slaves, aided by more than 3,200 conductors, escaped to the northern states, Canada, Texas, Mexico, and through Florida to the Caribbean. Harriet Tubman, called the Moses of the blacks, and Levi Coffin, a Cincinnati Quaker, were among the most famous members of the Underground Railroad. 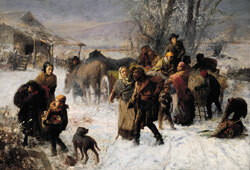 The Underground Railroad by Charles T. Webber was painted in 1893 and is a visual testament to the story of abolitionist activities in Cincinnati. The artist included three famous Cincinnati abolitionists in the painting: Levi Coffin, the reputed "president" of the Underground Railroad; his wife, Catharine; and Hannah Haydock. The painting speaks to the bravery of the people of Cincinnati during this tumultuous time. Painted over thirty years after the abolition of slavery, it is a visual reminder of this time in history. In this cross-curricular lesson, students of all grade levels will explore this painting and discover Cincinnati's contribution to the history of the Underground Railroad.